Something about seeing a tiny Auburn logo set against a giant Olympic logo really hit it home—the AUlympics start today. 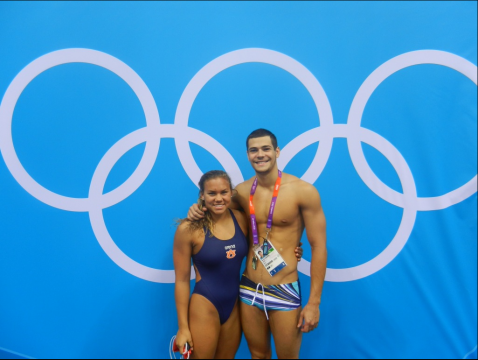 And Auburn freshman Megan Fonteno and Auburn sophomore Marcelo Chierighini look about as ready as you can get. Fonteno, an All-SEC First Team’er, is the only woman swimming for American Samoa, or as it’s unfortunately now known in Alabama, American Caramel deLite. This photo was taken Bahamian swim coach Brett Hawke (AU’99), who has thankfully taken up the torch of our #AUlympics hashtag. Everybody’s doing it! Related: AU’s ‘I Am Auburn’ Olympics promo video. Brett Hawke didn’t graduate in 1999.